Small cluster on the left, just above the large cluster on the right. 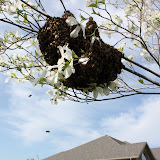 Here is a large swarm that I got a removal call on just north of Springfield, Missouri in Greene County . When I got there this morning the swarm had actually split into two clusters with bees on two adjacent branches, one slightly above the other. In the pictures above the smaller cluster was just above the 2nd picture which is of the larger cluster. They were neatly tucked into a lilac shrub. These pictures do not do this swarm justice as (although you can't see it in the picutre) the second larger cluster is about 8 inches in diameter and about 2 feet long. The smaller cluster is about 6 inches in diameter and 1 foot long. 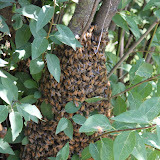 The size alone is what interested me in catching this particular swarm, since it was a bit far from my home. Based on the call I knew this swarm was not a samll one, so I prepared a hive body and a super to be able to hold the large quantity of bees. Upon examining the swarm, I could immediatly tell these bees were not acting in the normal doscile manner of most swarms. They were very touchy and became even more so as I proceded to remove them from the shrub. Aparently the homeowner, before calling me, had sprayed them with a fire extinguisher trying to get them to leave the location. I am thinking that may be what led them to be so aggravated. This is the first swarm that I actually put my bee suit on to get into a box. See me in the picture below. These girls were crazy mad at me. Notice them all flying arround. Not your typical swarm. In the picture you can see all the bees on top of the hive surrounding the small twig that I just placed on top. At this point the hive box already had a large amount of the bees inside, and there were still twice as many on the shrub. Most interesting was that although they seemed to like the hive body and moved in there were not large amounts of bees fanning their Nasonov glands as most swarms do. The majority simply climbed inside and checked out the boxes. The rest, well they kept trying to tell me that they didn't want to be bothered and you can see them in the pisture above flying arround, not happy with my presence. After about 3 hours of cutting, removing, more cutting and removing I finally got the most of the mass into their new home. I covered the hive and let it sit next to the bush so that all the straglers could come and join thir sisters. I then came back later in the evening to collect the boxes and the colony. You can see the bees still on the branch next to the hive and the mass that has made the boxes their new home.